Dr. Weiss is the Robert L. Sadoff Clinical Professor of Forensic Psychiatry, and Dr. Garfield is Clinical Assistant Professor of Psychiatry, Department of Psychiatry, Perelman School of Medicine, University of Pennsylvania, Philadelphia, PA.
Our recent journey to India began with presentations at the World Association of Social Psychiatry in New Delhi, where we addressed transinstitutionalization (K.J.W.) and barriers to men's communication in psychotherapy (R.G.). We visited the Taj Mahal at our next stop, Agra. Still giddy from monumental love, symmetry, and timelessness, and on the way to a tiger-spotting safari in Ranthambhore (we didn't spot any), we stopped at the abandoned town of Fatehpur Sikri. Our visit to the temporary home of the third Mughal emperor Akbar the Great, who reigned from 1556 to 1605, diverted our attention to an alleged system of justice with a startling twist. Our guide that day, Sunny, in a passing anecdote we took as a way to amuse tourists, mentioned the well-known fact that Akbar was fond of elephants. Not just fond, Sunny said, but reliant on them in battle, as illustrated in art depicting the Mughal period. The central structures of Fatehpur Sikri were magnificent, a meld of Hindu and Islamic styles. “You see that tall pillar out there?” Sunny asked, pointing to a tower on the edge of town. “That's the tomb of Akbar's favorite elephant, which protected the emperor in battle.” The elephant was called Harun and the tower Hiran Minar (deer tower, also called elephant tower because of the decorative tusk-like protrusions; Fig. 1). Okay, fine, Akbar was grateful to his noble pachyderm. Detail of Hiran Minar at Fatehpur Sikri (photo by Kenneth Weiss). Then Sunny blindsided us: “When Harun retired, Akbar appointed him Minister of Justice.” An elephant as Minister of Justice to a Mughal emperor? Already coming unhinged from the visual fantasy, we inquired, “Is this for real? How did this work?” Though wary that Sunny might be toying with naïve tourists, we sensed only sincerity from him. We had already learned that part of Akbar's greatness came from innovations in administration, especially by the appointment of dozens of specialized ministers. But an elephant? Curiosity pouring out of us, and jumping the gun a bit on Sunny's poker-faced narrative, we pressed him: “What were Harun's famous cases?” This did not get a direct answer, but Sunny, eager to please and sensing that our question was not totally facetious, revealed Harun's jurisprudence, a model of elegance in perfect counterpoint to our image of an elephant on the bench of justice. A criminal defendant, Sunny said, would be put before Harun in the minister's feeding pen. Presumably the thick-skinned jurist would regard the defendant's qualities in some inscrutable fashion. The ensuing meting of justice went as follows: If Harun disregarded the defendant and continued to eat, the defendant would go free. In the alternate scenario, Harun would trample the defendant to death. No, the defendant was not adjudicated deathworthy and sentenced by a cool, deliberate process. The elephant was the judge, jury, and executioner. We were too astonished by Sunny's story to ask for a source or reference. After all, we were talking about 500 years of oral history. Continuing our journey to an elephant sanctuary near Jaipur, we remained captivated by the story of Harun (Fig. 2). On returning home to Philadelphia, we tried to track down sources. We came up nearly empty handed on the subject of Harun's appointment, let alone his landmark cases. Chavda1 stated, “Reports that Harun, Akbar's favorite elephant was buried at [Hiran Minar] cannot be easily verified” (Ref 1, p 794). The definitive account of Akbar's reign2 speaks briefly about his system of justice: Although the supreme authority and the redress of grievances rests with sovereign monarchs, the capacity of a single person is inadequate to the superintendence of the entire administration. It is therefore necessary that he appoint one of his discreet and unbiassed servants as his judiciary delegate. This person must not be content with witnesses and oaths, but hold diligent investigation of the first importance, for the inquirer is uninformed, and the two litigants are cognisant of the facts. Without full inquiry, and just insight, it is difficult to acquire requisite certitude. From the excessive depravity of human nature and its covetousness, no dependence can be placed on a witness or his oath. By impartiality and knowledge of character, he should distinguish the oppressed from the oppressor and boldly and equitably take action on his conclusions. He must begin with a thorough interrogation and learn the circumstances of the case and should keep in view what is fitting in each particular and take the question in detail and in this manner set down separately the evidence of each witness. When he has accomplished his task with intelligence, deliberation and perspicacity, he should, for a time, turn to other business and keep his counsel from others. He should then take up the case and reinvestigate and inquire into it anew, and with discrimination and singleness of view search it to its core. If capacity and vigor are not to be found united, he should appoint two persons, one to investigate whom they call a Kázi; the other the Mir A'dl to carry out his finding [Ref. 2, vol 2, p 41]. 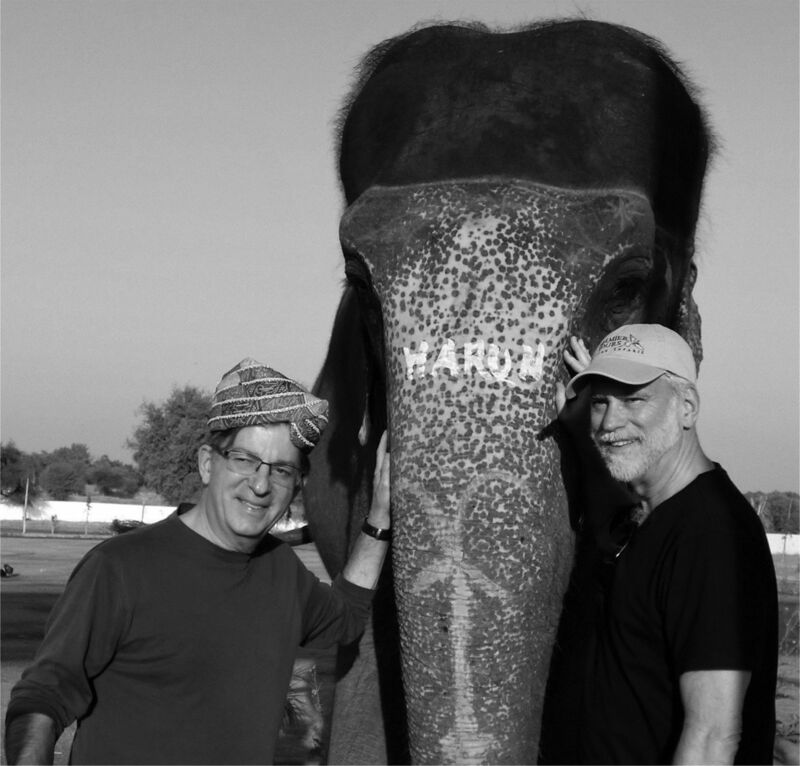 The authors with “Harun” (photo by Susan Weiss). This all sounds quite reasonable and not a matter easily delegated to an elephant. On the other hand, there is literature documenting execution-by-elephant across Asia.3,4 The elephant became the executioner of choice in Mughal, India. The animal was especially flexible, in contrast with the lion, in punishing humans only to the extent commanded. As Allsen observed: What is key here is that the elephant, actually under the control of a mahout, appears to be responding to the ruler's mood or his commands. This allowed the possibility of a last-minute reprieve, thereby producing a shaken, docile, and thankful, survivor…. Akbar, on several occasions, used this technique to chastise “rebels” and then in the end the prisoners, presumably much chastened, were given their lives. This same control also made it possible to conduct a kind of trial by ordeal, in which the condemned rebel, if he managed to fend off the elephant, was released [Ref. 3, p 126; internal references omitted]. “So what?” we thought. The point wasn't whether death by pachyderm was the fashion in 16th Century India. Instead, what was it about Sunny's story, albeit exaggerated, that retains traction for us as psychiatrists? What does it say about us and the justice system? In other words, what is the elephant in the courtroom? As we psychiatrists go about our routines of adding value to legal proceedings, the justice system lumbers to sort evil from sick and winners from losers. Is all justice Harunian? we mused. Citizens' rights are trampled every day and the mentally ill languish in correctional warehouses that provide no asylum. Judges and juries demand accountability, relegating learned expert witnesses to mutually canceling footnotes. Yes, Sunny, there is an elephant in the courtroom. The authors acknowledge the assistance of Sudev J. Sheth of the Department of History, University of Pennsylvania, for locating resources on Emperor Akbar and Mughal justice.